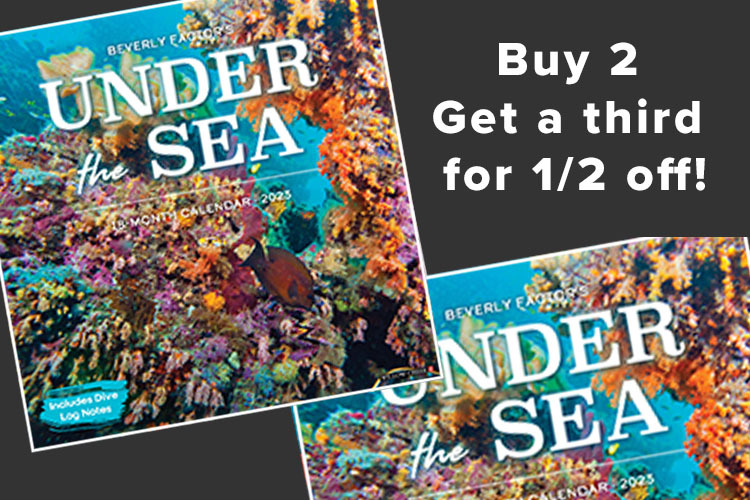 In this UNDER THE SEA calendar, Beverly Factor presents her most stunning images, offering a unique view of the seldom seen creatures under the sea. The 18-month calendar features 24 full color, beautiful underwater images - each captioned with fascinating and informative facts including dive log notes listing the dive sites and the dive boats. The glossy calendar is 12" x 12" with a full page image each month as well as an inset picture. The UNDER THE SEA calendar appeals to all types of "sea" loving people and fish enthusiasts. It is a great educational tool for children! As an extra bonus, request to have your calendar signed by Beverly! Shipping for each calendar in U.S.- $15.00 for one order of three California residents add sales tax.